The Counter-Islamophobia Kit project documents and critically analyses dominant Islamophobic narratives in operation, and also counter-Islamophobia narratives and related best practices employed in eight EU member states (Belgium, the UK, France, Germany, Hungary, Greece, Portugal, and the Czech Republic) in order to produce the CounterIslamophobia Kit. This Toolkit identifies and postulates narratives, arguments, strategies and actions that will be able to directly counter Islamophobia and set guidelines on best practice aimed at countering this form of racism. 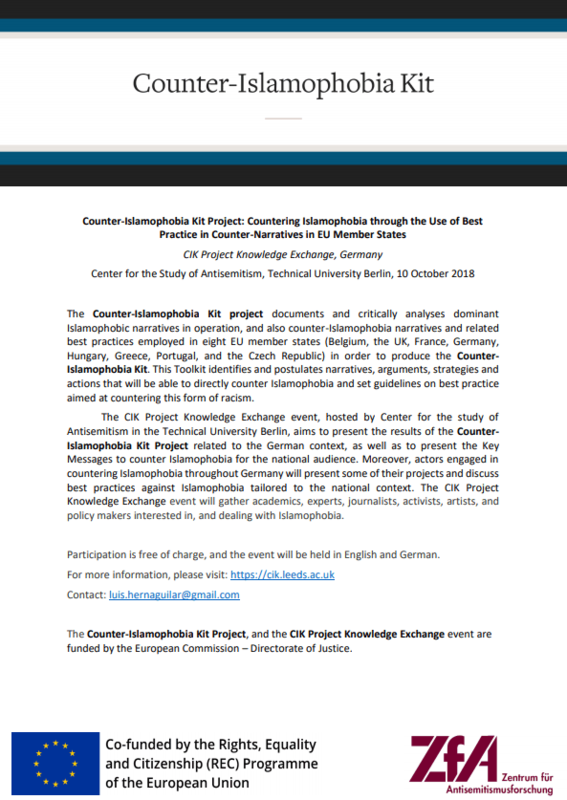 The CIK Project Knowledge Exchange event, hosted by Center for the study of Antisemitism in the Technical University Berlin, aims to present the results of the CounterIslamophobia Kit Project related to the German context, as well as to present the Key Messages to counter Islamophobia for the national audience. Moreover, actors engaged in countering Islamophobia throughout Germany will present some of their projects and discuss best practices against Islamophobia tailored to the national context. The CIK Project Knowledge Exchange event will gather academics, experts, journalists, activists, artists, and policy makers interested in, and dealing with Islamophobia. Participation is free of charge, and the event will be held in English and German.